Sony MDR NC300D phones show the world what anti-noise technology can achieve, but does not come close to closing the case. 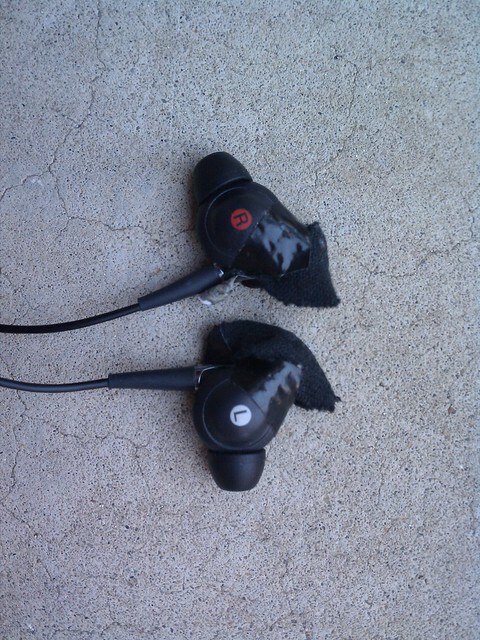 In our quality in use test, these earphones received mixed feelings. Across use cases the performance ranges from very problematic to awesome. Let's review the product argument by argument, use case by use case. We also tell you how to tackle wind noise issues. Sony has been good at earphones, but the sound quality delivered by NC300 is still amazing! In comparison to few previous Sonys in the class below $100 and Sennheiser CX300/II, this model is in every way a step ahead. The sound reproduction is very neutral across the spectrum and clarity is just stupefying. It has been some time since I last tried noise cancelling earphones, which might explain the wow effect caused by Sony. Noise blocking works like wonders with the in-ear set, possibly because the anti-noise function adds up to the isolation provided by the plugs. Noise block is most impressive in acoustic conditions that are in the uncomfort zone: on aboard an airplane and motorcycling. These uses cases are illustrated below, but in short, NC300 have provided the first time experience of ever really being able to enjoy music in these contexts. The biggest issues I had with these earbud phones relate to ergonomics. The problems arise from the fact the NC300 phones are big and bulky. Although a fine selection of ear piece is provided, or maybe just because of that, the fitting of the ear pieces is difficult. The size and weight of the pieces creates a feeling that the phones are about to fall off – which happens to be true for the most of the time. The microphones embedded to the phones also poke out quite inconveniently. They make it uncomfortable or even impossible to wear anything over your head while wearing the phones or even leaning your head against anything firmer than a pillow. Sony has previously had issues with the cord material and strangely this custom continues. The wiring harness is odd, very soft rubber and does not feel good to handle. The length of the cord is quite ok, but the digital processing unit in the middle is again quite bulky. Eating up one AA battery, the elegant metallic control unit is bigger than many MP3 players I know. Assuming you are going to hook it up to a phone or PMP, the combination is gonna wear and tear your pocket. And coming back to the dead weight of the battery, it doesn't beat a MP3 player even if you're using a regular high-energy battery. The last surprise originates from the “outstanding” microphones. As they protrude from the ear piece they are prone to catch any wind if there is such. So trying to use the phones while riding a bike or a motorcycle is born to fail because the anti-noise mechanism picks up sound from the microphones and blows it to your ears in the reversed phase. And I tell you, that's not music. So, when it eventually comes to assessing the merit of the device, I must say that this relatively high-end product does not quite life up to its price. There few serious design flaws which makes its utilization awkward. If it were a mature product, the price tag might feel more justified. Walking with the phones is an easy thing to do. Before you start walking over 6 mph, the fitting problems do not present themselves and the phones won't fall out. But say that you take it on a bike ride and double the speed to 12 mph, you're in trouble. The wind noise becomes quickly unbearable and you have to fix yourself a custom, DIY wind screen to enjoy the music. On the other hand, if you do this, you will have an opportunity to enjoy music while riding like never before. NC300 is not really suited for sports requiring the use of helmet. The big ear pieces can make wearing a helmet either uncomfortable or impossible. I tried the phones while riding a motorcycle and oh boy did I have a good time trying to fit them on! After probably 5 attempts with a helmet hood I finally made it and need to say that it did pay off. For one time experience, I managed to really hear the lyrics while maintaining a safe sound pressure level. Really impressive, but really difficult. But the situation in which Sony really blazes is flying. These are definitely the best equipment I've tried for air travel. The noise blocking felt more effective than with Sony MDR NC500D (regular headphones) and if you can stand the in-ear phones for a longer period of time, these phones are definitely worth checking out.